One can spend a long time with JUDITH SARGENT MURRAY, but for now let me fill in the gaps in her life, promising to return at a later date. Judith and her first husband John Stevens had no children although they adopted his niece and a young cousin of hers. After the Revolution, when Stevens found himself in financial distress, Judith began to write for publication in the hope of earning some money. For “Desultory Thoughts upon the Utility of Encouraging a Degree of Self-Complacency, Especially in Female Bosoms,” which appeared in Gentleman and Lady’s Town and Country Magazine, she adopted the pseudonym “Constantia.” To avoid debtor’s prison John Stevens fled to the West Indies where he died in 1786. Two years later the young widow married Reverend John Murray. Their first child, a son, lived but a few hours. In 1791 she was delivered of a daughter named Julia. Judith continued to publish essays focusing on equality of the sexes and the education of women. Assuming the identity of a man she wrote a column for the Massachusetts Magazine called “The Gleaner,” in which she explored political, religious and moral subjects; a collection of these essays appeared later as a book which she published herself. In addition she wrote poems and she authored two plays that were actually staged. John Murray suffered a stroke in 1809 and Judith devoted herself to his care until his death in 1815. Their daughter married well and when she and her husband moved to Natchez, Mississippi, Judith went with them. She died there in 1820. As has been noted in an earlier post her letterbooks were discovered on a nearby plantation some 164 years later. Judith Sargent Murray was a remarkable woman whose works have relevance today. Additional information about Murray can be found HERE and HERE. The first husband of JUDITH SARGENT MURRAY was John Stevens whom she married at age eighteen, more to satisfy her parents’ expectations than from love. The English preacher John Murray met Judith in 1774 when he visited Boston to lecture on Universalism, a doctrine that emphasized universal salvation and an egalitarian view of the world. They commenced a correspondence mostly on religious matters while Murray toured New England. During the war Murray became an army chaplain to prove his sympathy for the American cause. When Judith, her father, and her uncle were suspended from their parish church in Gloucester for their dissident views, they and others formed a new religious organization calling themselves Universalists and choosing John Murray as their pastor. In 1786 after his business ventures failed, Judith’s husband John went to St. Eustacius in the West Indies to escape his creditors and to attempt to recoup his losses. He died there in 1787. 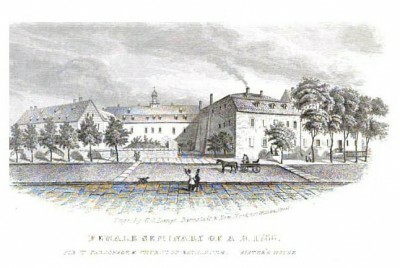 Shortly thereafter Murray proposed to Judith and she married the man she called the “choice of my heart.” Judith’s interest in religion and her own religious beliefs are clearly reflected in her observations of the Bethlehem Seminary in the continuation of the letter to her sister-in-law. The sisterhood consists, at this time, of about one hundred Maidens, who after a night of such slumbers, as health, and innocence bestow, assemble in an elegant apartment which is a consecrated Chapel—This apartment is properly fixed up, it is furnished with an Organ, and Musick books, and upon the right, and the left, the following inscriptions, in beautiful capitals meet the eye. “God hath appointed us to obtain salvation, by our Lord Jesus Christ, who died for us, that whether we wake, or sleep, we should live together with Him. I will greatly rejoice in the Lord; my soul shall be joyful in my God, for He hath cloathed me with the garments of salvation, He hath covered me with the robe of righteousness” [—] In this Chapel the female Choir, at early dawn, and at closing evening, hymn the praises of the Redeeming God, and prostrating themselves in His presence, the most venerable individual among them, presents their united petitions, and thanksgivings, at the throne of Grace. . . .
At one board they are every day seated, and persons selected for the purpose, prepare their table. The Wash house is at a considerable distance, where the apparel of the sisterhood, the Tutoress, and their pupils, is made fit for use, and in the best possible manner. . . .
More of Judith’s letter in the next post. Bonnie Hurd Smith, the founder of The Judith Sargent Murray Society, has transcribed and published Murray’s letterbooks. See the complete letter HERE. After the death of her child in 1789, JUDITH SARGENT STEVENS MURRAY and her husband John embarked on a six-month journey, via horse-drawn carriage, from Gloucester to a Universalist convention in Philadelphia. She wrote letters to her parents describing her encounters along the way. 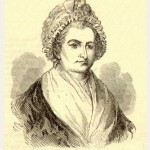 In 1790 she wrote from New Rochelle, New York, describing a meeting with Martha Washington in New York City, which was then the capital of the United States. This is a repeat of a blog posted in 2011. Note the use of the word condescension” above. It has a pejorative connotation today, but in the eighteenth century its use was intended to be flattering, connoting the virtue of “generosity.” Judith Murray continued to speak out and write on social and political issues. 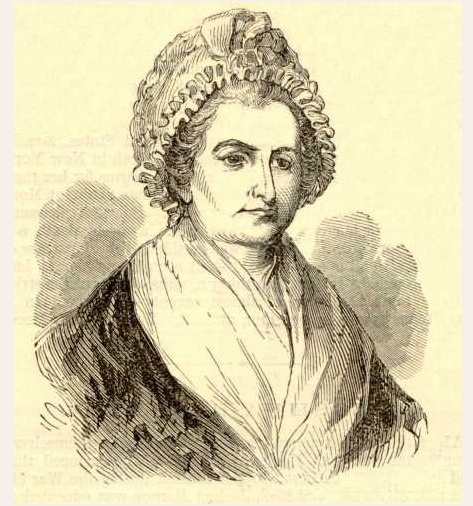 She wrote plays that were performed at the Boston Theatre on Federal Street and she was the first woman to self-publish a book, The Gleaner, in 1798. After John Murray died Judith went to live with her daughter and her husband Adam Lewis Bingaman in Natchez. She died in 1820 at the age of 69. As the daughter of a fairly well-to-do merchant family living in Gloucester, Massachusetts, JUDITH SARGENT STEVENS MURRAY received the typical education for a girl at the time while her brother had a tutor to prepare him for entrance to Harvard. To make up for her perceived educational deficiency she read widely on her own from books in her father’s library. At age eighteen she married John Stevens; it was considered a good match. When her father became interested in the new theology of Universalism Judith met the English preacher John Murray who visited Gloucester in 1774. She struck up a correspondence with him that continued through the Revolutionary War. Eventually she and her family broke with the Congregational church and established a new religious society called the Independent Church of Christ choosing Murray as their pastor. Finding himself so burdened by debt because of the war and trade embargoes John Stevens, Judith’s husband, was forced to leave the country for the West Indies in 1786. He died soon thereafter and John Murray asked Judith to marry him. At age thirty-nine she became pregnant; sadly, the child was stillborn and Judith herself nearly died. Here is the poem she composed expressing her sorrow. In 1791, at the age of forty-one, she became pregnant again and was delivered of a healthy girl, Julia Maria. LINES, Occasioned by the Death of an Infant. And innocence its spotless vigils keeps. Assumes the charge of the immortal mind. And all thy heavenly influence employ. To shield, and guide, her utmost powers combine. But agonized nature trembling sighs! And clos’d a life with early evil fraught. And every pang without regret sustain! And to no mortal gaze thy worth unfolds. All of my first born child that e’er was mine! And o’er my dead the sigh of pity breath’d. Where wisdom blending, innocence entwines. And from eventual ruin man protects. To lead me where each sacred pleasure flows. Amid the infant host my cherub trace. And an eternal day shall yet be mine. The poem can be found HERE. For more information about Judith Murray’s life check this SITE.